A panel covers a distinct set of regions within the genome, which are sequenced in parallel. Most often these targets are exons of genes. Prior to high-throughput sequencing, a custom set of targets is enriched, and only these will be sequenced. CeGaT has been using this concept in genetic diagnostics since 2009. Based on our longstanding expertise, we offer individual custom panel design and subsequent panel validation. When processing your sequencing order, we focus on delivering results with high quality and reliability. Each project is led by a scientific project manager who will be your contact person during the entire project phase. Upon completion of your project, you will receive a detailed project report with further information regarding sample QC, important laboratory parameters, and bioinformatic evaluation and explanations. CeGaT assists in target definition based on genes, chromosomal positions, transcripts, and more. Please do not hesitate to contact us; we are happy to design an individual concept for your project. If possible, please provide us with information about sample material, number of samples, and preferred sequencing depth. Comparison of sequencing coverage of the first four exons of AIPL1 – a gene involved in the etiopathogenesis of hereditary retinopathies. Exonic regions are depicted at the bottom of the figure by thick bars. Thin lines in between symbolize intronic regions. Coverage is represented by grey curves. 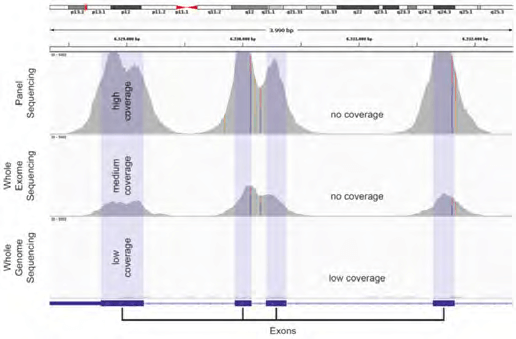 In exonic regions, coverage is highest in the panel-sequencing approach due to targeted enrichment. Coverage is substantially lower in the whole-exome and whole-genome sequencing approach.